Local oil painter, Steve Hessler, will be the featured artist at Weaver Street Realty during the Chapel Hill-Carrboro Second Friday ArtWalk on Friday, June 14 from 6:00 to 9:00 p.m. A Meet the Artist reception will be held at the realty’s 116 East Main Street location in downtown Carrboro. Refreshments will be provided. For this show, Hessler has selected works depicting scenes of Carrboro millhouses and of southern Orange County. He also plans to display his portable field easel as part of the event. 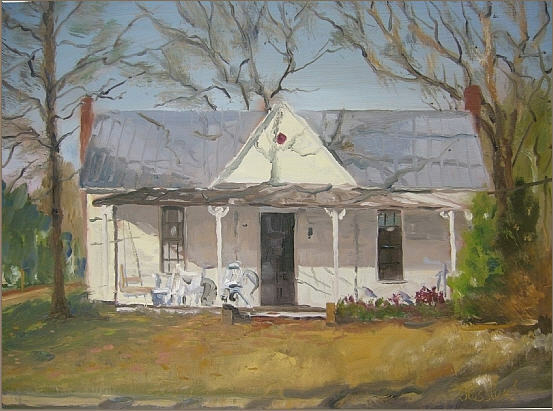 Hessler is frequently seen painting in Carrboro’s historic district and along county roads near his home outside of town. His work can be viewed on his artist’s website at http://stevehessler.com. Hessler hopes that his paintings of these structures will promote more historic preservation. He carries this mission forward in his painting workshops and through his participation in the Textile Mill Heritage Initiative at Cooleemee. Hessler’s work will be on display at Weaver Street Realty throughout the month of June. He is represented by the North Carolina Crafts Gallery (http://nccraftsgallery.com) in Carrboro and the Little Art Gallery (http://littleartgalleryandcraft.com) in Raleigh.